One New Aftermarket Replacement Cylinder Head Gasket Set made to fit John Deere Gas Tractor models: 40, 320, 330, M, MC, MT -- (All Gas). For Gas Models Only, Not Diesel. Set Includes: (1) Cylinder Head Gasket, (1) Manifold & Carb Gasket, (1) Oil Pan Gasket, (1) Distributor Mounting Gasket, (1) Oil Filter Case Gasket, (1) Valve Cover Gasket, (2) Valve Cover Seal Gaskets, (1) Water Elbow Gasket, (2) Water Outlet Gaskets. Replaces Part Numbers: ENB10-0012, RE527354, AM808T. We carry parts for Engines, Transmissions, Front & Rear Axles, Hitch & Drawbars, Undercarriages, Final Drives, Seats, Bearings, Cups, Cones, Seals, Discs, Couplers, Gears, Brakes, Pressure Plates, Pilot & Throw Out Bearings, Ring & Pinions, Gaskets, Decals and MORE for most high wear items. We also carry replacement parts for the Boom Cylinder (Seal Kits, Tubes, Glands, Pistons, Rods). 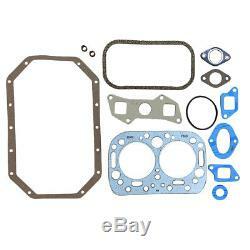 The item "RE527354 Cylinder Head Gasket Set for John Deere 40 320 330 M MC MT Gas" is in sale since Thursday, September 11, 2014.